Megachurch Pastor Robert Jeffress: Kneeling Players Would Be Shot In The Head In North Korea [VIDEO] - Joe.My.God. 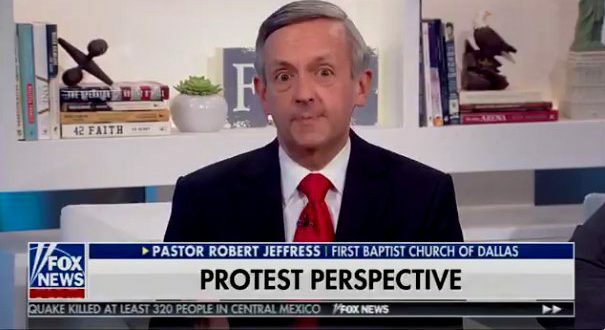 Robert Jeffress, pastor of First Baptist Dallas, said Monday that NFL players kneeling to protest during the national anthem should thank God they don’t have to worry about being shot in the head “like they would be in North Korea.” Jeffress, an adviser to President Donald Trump, made the comment during an appearance in the Fox & Friends show, where the hosts and guests tend to be friends of the Trump administration. Jeffress — a member of the president’s evangelical advisory group — agreed with Trump, as he usually does. Unprompted, he drew a connection between the NFL controversy and North Korea, whose leaders have engaged in a war of words with Trump. As you’ll see in the clip, Jeffress also manages to drag in anti-gay business owners as making legitimate protests, unlike NFL players.